"Want To Spend More Time Enjoying Your Dive And Less Time Fiddling With Your BC? Improve Your Buoyancy Control On Your Next Dive"
Stop taking the pleasure out of your dive with poor buoyancy control. We have straightforward easy to follow tips and techniques to help you look more like that steady floating divemaster in front of you instead of the Energizer buddy. Does this ring a bell? There you are, ready to enjoy a nice leisurely dive. But wait, you are too close to the bottom. Ok, put more air in the BC. Oh no. Now you are rising too far above everyone else. OK, take some air out of the BC. Look, the divemaster is pointing out something under the coral head. Swim over and try and take a look but you can't stay in one spot. You barely see what he was pointing out (if you are lucky) and swim away because you don't want to hit someone or something. Plus, you need to let the next diver in line get a chance to see it too. Nothing can take the pleasure out of a dive like poor buoyancy control. Instead of being the energizer bunny you can look like the experienced diver who just floats along effortlessly and seemingly makes no movement. Once you have your buoyancy under control - look out. You will have a whole different feeling to your diving. I remember when I finally reached that state – just floating and not really moving save for the occasional fin kick to keep with the group. It's a whole new world of diving when you are neutrally buoyant. No more reaching for the inflator and letting in air, letting out air. No more fighting to see under the coral head..you know the drill. The reason for this is as you are fighting to become neutrally buoyant, you are using air to put in your BC. You are also using your energy - and, therefore, air - to try and stay steady in the water column. You are going to end that now. And I want you to get there faster than I did. Use my experience - and not your air - to end the ups and downs once and for all. To help you, I have put together a straight forward user-friendly report full of easy to follow tips and techniques that will help improve your buoyancy control once and for all. Throughout the report, I give you my real life experiences and examples as I tried to attain neutral buoyancy. You can learn from my experiences - and my mistakes. The report is written in plain English, from one diver to another. Don't suffer through another elevator ride underwater. Get closer to neutral buoyancy on your very next dive. 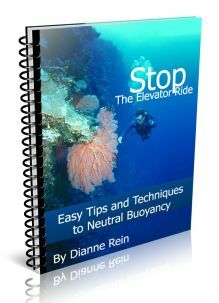 Order "Stop the Elevator Ride - Easy Tips and Techniques to Neutral Buoyancy" and improve your buoyancy control on your very next dive. If you're not completely satisfied with your results, I will give you a full 100% refund. I stand behind my materials completely and know you'll be very happy with the content and, more importantly, the results. Simply send me an email with your receipt using the contact link below in the first 90 days for a full refund. looking like a divemaster instead of a "newbie"
These two aspects of a dive may seem deceptively simple. There are some things you need to consider before you even start to descend and start working on your buoyancy - and we cover them here. Once you are down and floating along - you will also have to ascend safely. We give you all the information you need to know to get to the surface safely - which is one of the most important periods of any dive. You had a great dive and you do not want to get this part wrong. Yes, Dianne, I want the Special Report to learn how to become neutrally buoyant. I have read and agree to the legal disclaimers below. Click on the "Buy Now" button below to have the report delivered instantly in an an ebook (pdf) format for only $7.00. After your order you will immediately receive an email that will contain the download link for the report. If you do not see it within several minutes, please check your spam folder. Don't forget, this is the 100% practical real life side of diving. I give you straightforward easy to follow tips and techniques so you can start floating steadier on your very next dive. End the elevator ride once and for all - and start enjoying your dives much more. Try out our report with no risk - we have a an iron clad money back guarantee for a full 90 days . If you are not completely satisfied with this report, just email me with your receipt and your money will be refunded. No questions asked. So start looking more like the divemaster and less like the energizer bunny on your very next dive. Order your report now for only $7.00.